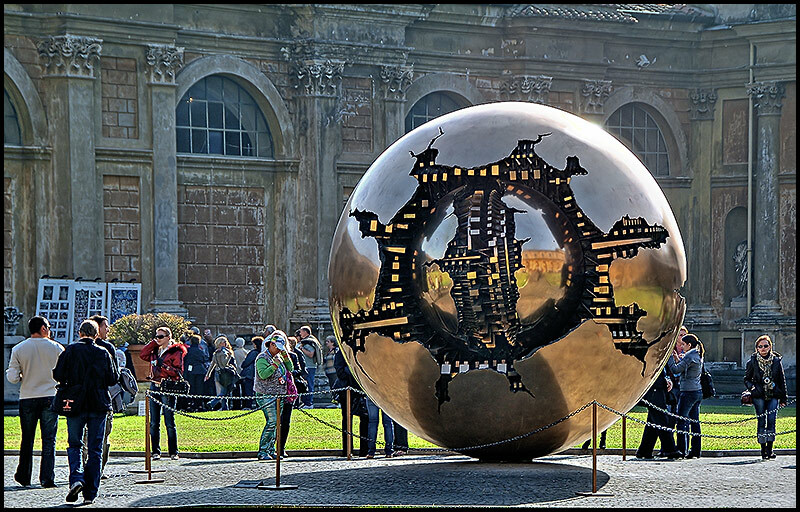 "Sfera con sfera" (Sphere Within Sphere) by Arnaldo Pomodoro was commissioned especially for the Cortile della Pigna (Courtyard of the Pinecone), Vatican. This bronze sculpture, 4 meters in diameter freely rotates on its axis changing its shape. Using the basic shapes of cube, cylinder, and sphere, Pomodoro tears open his spheres' pristine, highly polished surfaces to reveal the internal structure of form. Underneath the gleaming skin and solid flesh of the bronze lies a regulating machinery of cogs and gears, which he calls “sign systems,” akin to the complex interlocking systems of language or of organic bodies. Some of Pomodoro's Sfera con Sfera can be seen in Trinity College, Dublin, the United Nations Headquarters in New York, the Hirshhorn Museum and Sculpture Garden in Washington, D.C., and the University of California, Berkeley. И неплохо смотрится в ватиканском дворе. Спасибо за познавательное примечание!!! Отличная работа Сабирджан!!!!! Рад, что вам было интересно, спасибо! и окружение тоже, спасибо, Надежда! Спасибо, Виктория. Рад, что заинтересовал вас.